Adopt PLC program centralized control, self-adjustment for ice thickness, self-adaptation for ambient temperature and balance between auto ice forming and water supplying, no requirement to manual adjustment. 3. Freezing time: 20 minutes for 22mm*22mm*22mm and 23 minutes for 29mm * 29mm * 22mm. 6. Superior quality, low maintenance, high productivity. 1. Reasonable design, save space, very easy to install. 2. Enormously help you save energy, only 80-85kw power is consumed to produce one ton ice. 3. Ice drops automatically, auxiliary ice harvesting equipment isn’t required, low error rate. 4. 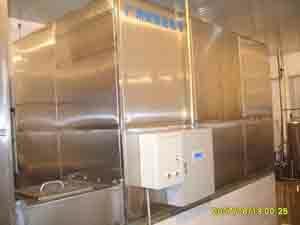 Ice outgoing automatically, no need take ice by hand, which can guarantee the ice fully clean and sanitary. 5. Install as per installation guidance, provided with failure alarm system which ensure any failure can be detected and informed automatically. Standard working conditions: input water temp. : 16 ℃, Ambient temp. : 25 ℃, Evaporating temp. : -10℃, Condensation temp. : 40 ℃. 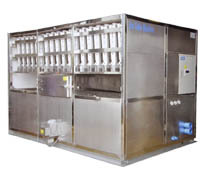 Large food-grade cube ice machine is the first type of cube ice machine to adopt three leading technologies:self-adjustment for ice thickness,self-adaptation for ambient temperature and balance between auto ice forming and water supply,which have completely solved the problem of vary ice thickness when making ice in different ambient temperature. By reasonably applying two patented technologies:flat-plate heat exchange technology & circulating heat gas for ice forming technology, we break through sush problems of food-grade cube ice forming technology,we break through such problems of food-grade cube ice machine:low production, high power consumption and unstable ice dropping ect, which have offered important technology guarantee for our product to enter info the international market. 1.large production: It’s production can reach 90%-95% in summer. When the ambient temp is lower than 23 ℃,compared with other small type cube ice machine(only 50%-60% in summer),its production can reach 100%-130%. 2.Low power consumption: It’s power consumption is 85 degree-90 degree per ton in summer. When the ambient temp is lower than 23℃, compared with other small type ice cube machine(150 degree-165 degree per ton),its power consumption is only 70-85 degree per ton. 3.Easy operation: Adopt PLC program centralized control, self-adjustment for ice thickness, self-adaptation for ambient temperature and balance between auto ice forming and water supplying, no need to adjust by hand. 4.Optional equipment: Equipped with auto ice spreading system and special ice packing system for the machine, it can not only reduce manpower, more important is that it can ensure its edible safety, reach food standard, and improve its competitive advantages.